Buggy Bootcamp – THE RESULT! 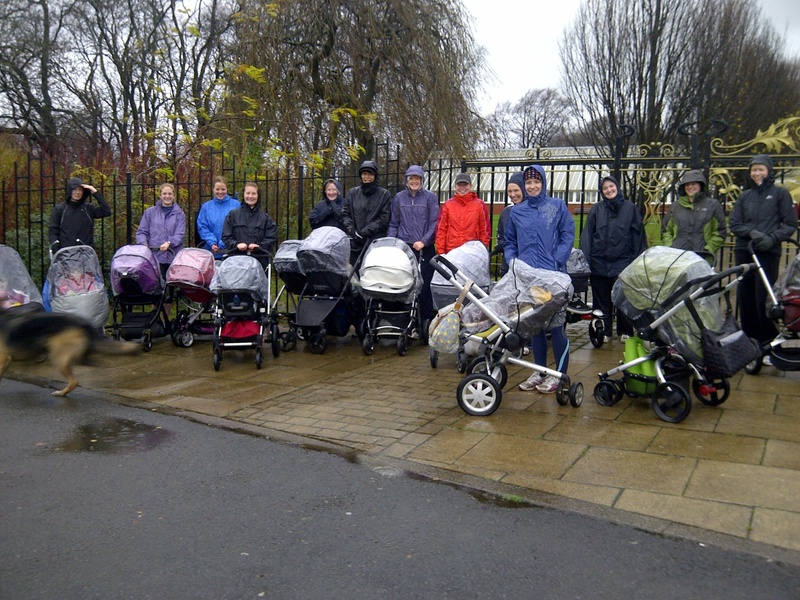 Through rain, snow and Hurricane Bawbag I have been in the park for my twice-weekly Buggy Bootcamp sessions. *two slices of banoffi pie – (two different days) at my mother-in-law’s, a woman you cannot refuse! Our final session was on a sunshiney day, which made a nice change. Wendy was on a mission though – the hill runs were back in the routine, only this time we had to do FOUR instead of three and straight into press-ups in between, no breaks. A quick drink and we were off again, jogging to the next station for lunges, squats and – you’re kidding right – another hill run? But we had to continue up all the steps at the top? Twice? That’s that Lindt bunny taken care of, no probs. I have lost three inches from my waist and an inch from each upper arm. My legs have stayed the same. So thank you Wendy for coming up with a cunning plan to keep us all dedicated through the horrendous weather. I’ve really enjoyed it. 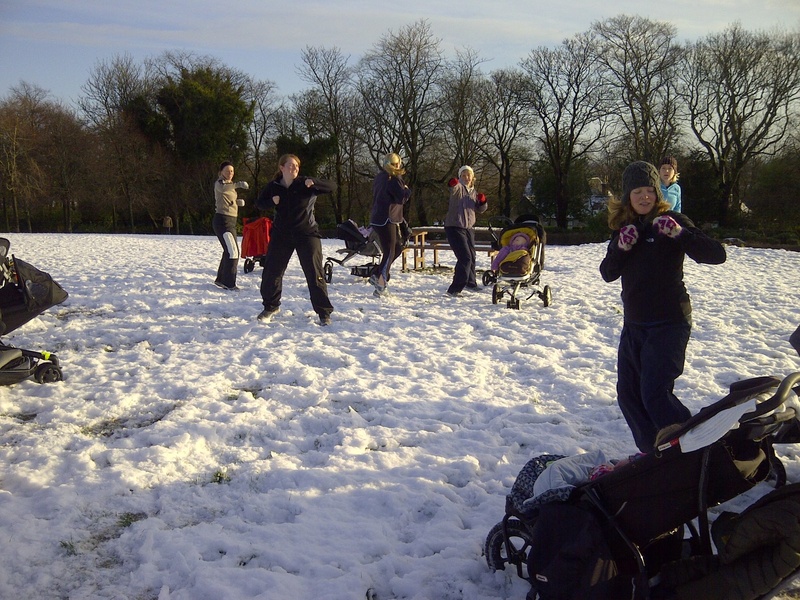 In fact, I did my own little Buggyfit session in the park this morning. Here’s to a fitter 2012! 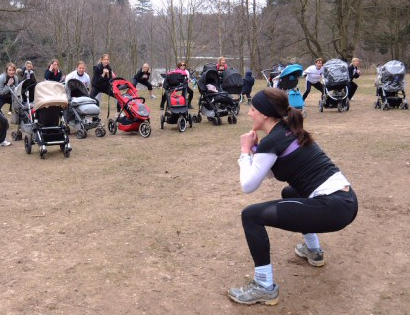 When I first wrote about Buggyfit I joked it was like Buggy Bootcamp. Well, either the instructor read my blog or I’m psychic because now it actually is. I have signed up to the pre-Christmas, 6-week, twice weekly Buggy Bootcamp which comes complete with nutrition plan and supplementary exercises. Today was session 3 of 12 and I am quite chuffed I’m not dead yet. Far from it, in fact. I’ve been going once a week since July and I am no longer the sweaty, frizzy, red one at the back – I’m the perspiring, curly, pink one quite near the front. So I thought I should step it up and lose those last few pounds before I pile them all back on over the festive season. We were all weighed at the start. I was quite disappointed to see I was exactly the same weight as I was when I started Buggyfit four months ago, but as one of the other mums comforted me, we were fully clothed in winter gear. So that must count for a pound or two. The first session was three days after I returned from a ten day holiday in the Canaries so I expected it to be a bit of a kick in the proverbials. It was OK.
As far as the nutrition plan is concerned, I’m pretty much following it. We were at a wedding at the weekend so I’ve written off two days but I’m back on it now. I had forgotten about the extra exercises until one of the mums reminded me today – so I’ll need to shoehorn some abdominal work, lunges and squats into my working mum’s diary somewhere. My aim is to lose a pound a week. There. I’ve written it down so I have to stick to it. Six pounds in six weeks.